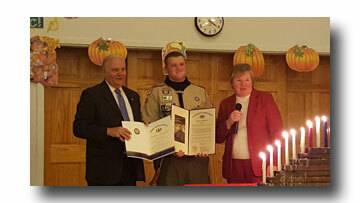 Senator Mensch was honored to join Brigadier General (Ret.) 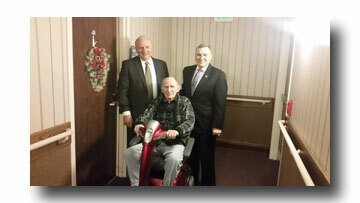 Jerry Beck, Deputy Adjutant General –VA, in giving a fellow veteran, Robert Trego, an unused scooter. The Pennsylvania Treasury has issued a warning about a phone scam targeting state residents. As part of the scam, callers fraudulently claiming to be from Treasury threaten to arrest residents if they don’t immediately provide credit card or other financial information to pay unpaid state taxes. The Pennsylvania Treasury does not collect taxes or seek payments via phone and has no authority to arrest individuals. In addition, any services that Treasury provides to the public, including processing unclaimed property, are free of charge. Anyone receiving a suspicious call or email should terminate contact immediately and refrain from sharing personal financial information, including bank account or credit card numbers. Please report any suspicious calls to the local authorities. You can report suspicious activity directly to the Pennsylvania State Police by using the "See Something Send Something" app on your mobile device. Terrorism/Fugitive Tip Line - 1-888-292-1919 Use this number to report suspicious individuals or activity that may be directly or indirectly associated with terrorists or terroristic activity and to report information on individuals listed on the Pennsylvania State Police Top Ten Most Wanted poster. Individuals reporting information will not necessarily be contacted. Pennsylvania State Police Ten Most Wanted The Pennsylvania State Police Fugitive Apprehension Unit seeks assistance with locating individuals listed on the Pennsylvania State Police Ten Most Wanted Poster. Drug Trafficking Tip Line - 1-877-PA-NODRUGS Report drug traffickers in your neighborhood 24 hours a day via this toll-free hotline. Megan's Law Tip Line - 1-866-771-3170 If you believe any of the information found within Pennsylvania Megan's Law registry is inaccurate, please contact the Pennsylvania State Police, Bureau of Records and Identification, Megan's Law Section, 1800 Elmerton Avenue, Harrisburg, PA 17110. Underage Drinking Tip Line - 1-888-UNDER21 The information obtained from this line is directed to the Bureau of Liquor Control Enforcement. Callers, who can remain anonymous, are encouraged to provide tips about planned events involving underage drinkers or about parties already underway. The Pennsylvania State Police refers calls that require immediate attention directly to the proper agency for whatever action that agency deems appropriate. Liquor Enforcement Complaint Hotline - 1-800-932-0602 The Bureau of Liquor Control Enforcement operates a toll-free hotline to receive complaints on Liquor Code Violations. When leaving a voice mail message, speak slowly, clearly, and provide all available information. Include name and address of licensee or speakeasy operator, days of the week or time of day the violations are occurring, or any other information that could assist the investigation. All information is kept confidential. Contact information is not required to report a violation however is requested in the event additional information is necessary. Or, fill out an Online Liquor Control Complaint Form. PA Crime Stoppers - 1-800-4PA-TIPS After the media provides the details of a PA Crime Stoppers release, they also provide a toll-free telephone number for anyone with information to call. When an individual has information about the PA Crime Stoppers release, they can pick up the telephone and call the Crime Stoppers Hotline. The caller is assigned a special code number and not required to give a name. Instructions are given to call the hotline again at a later date to find out if the information qualifies for a cash reward. Pennsylvania Amber Alert Plan The Pennsylvania Amber Alert Plan (PAAP) website is used as an additional source for a Pennsylvania Amber Alert activation. The website is used to post updates and/or cancellations concerning an Amber Alert Activation. The information posted remains for a period of 24 hours. The public is encouraged to register on the Amber Alert Web Site. Once registered, they will receive e-alerts, which are email messages containing the text of Amber Alert activations. Users may also register to receive Amber Alert notifications via their cellular phone. The Department of Environmental Protection (DEP) is offering rebates to Pennsylvania residents to assist with the cost of purchasing an alternative fuel vehicle. These rebates are funded by the Alternative Fuels Incentive Grant Program, which is supported by a gross receipts tax on utilities. To qualify, the vehicle must be registered in Pennsylvania, operated primarily in-state, and be purchased no more than six months before the rebate application is submitted. Large-battery vehicles are eligible for a rebate of $2,000 (examples include models such as the Nissan Leaf, Ford Focus, Chevy Volt, and similar models from BMW and Tesla). DEP is also offering rebates of $1,000 for plug-in hybrid electric vehicles and battery-electric vehicles (examples include the Toyota Prius plug-in, Ford C-Max Energi, Ford Fusion, and Honda Accord). Rebates of $1,000 are also being offered for natural gas, propane, hydrogen or fuel-cell vehicles, such as the CNG-powered Honda Civic or any new CNG powered car or pickup truck. CNG original equipment, manufacturer retrofits, or certified conversions to CNG or propane are also eligible for the $1,000 rebate. A $500 rebate is available for electric motorcycles and scooters. There are only a limited number of rebates available at $2,000. The rebate program offered will be reassessed upon payment of the first 250 rebates at $2,000 or June 30, 2016, whichever occurs first. For more information on the types of eligible vehicles and to apply for a rebate, click here. A bogus email asks tax professionals to update their IRS e-services portal information and Electronic Filing Identification Numbers (EFINs). The links that are provided in the bogus email to access IRS e-services appear to be a phishing scheme designed to capture your username and password. This email was not generated by the IRS e-services program. Disregard this email and do not click on the links provided. For more information on this scam, see IR-2015-31, IRS Warns Tax Preparers to Watch out for New Phishing Scam; Don’t Click on Strange Emails or Links Seeking Updated Information. Or, victims may be told they have a refund due to try to trick them into sharing private information. If the phone isn't answered, the scammers often leave an “urgent” callback request. Note that the IRS will never: 1) call to demand immediate payment, nor will the agency call about taxes owed without first having mailed you a bill; 2) demand that you pay taxes without giving you the opportunity to question or appeal the amount they say you owe; 3) require you to use a specific payment method for your taxes, such as a prepaid debit card; 4) ask for credit or debit card numbers over the phone; or 5) threaten to bring in local police or other law-enforcement groups to have you arrested for not paying. Email Phishing Scam: "Update your IRS e-file"
The IRS has been alerted to a new email phishing scam. The emails appear to be from the IRS and include a link to a bogus website intended to mirror the official IRS web site. These emails contain the direction “you are to update your IRS e-file immediately.” The emails mention USA.gov and IRSgov (without a dot between "IRS" and "gov"), though notably, not IRS.gov (with a dot). Don’t get scammed. These emails are not from the IRS. Taxpayers who get these messages should not respond to the email or click on the links. Instead, they should forward the scam emails to the IRS at phishing@irs.gov. For more information, visit the IRS's Report Phishing web page. The IRS does not initiate contact with taxpayers by email to request personal or financial information. No matter how some things are sliced, they're still baloney. If someone tells you that you don't have to pay taxes, check out The Truth About Frivolous Tax Arguments. This IRS.gov exclusive addresses some of the more common false legal arguments made by those opposed to compliance with the federal tax laws. Each contention is briefly explained, followed by a discussion of the legal authority that rejects the contention. The second section deals with frivolous arguments encountered in collection due process cases. The final section illustrates penalties imposed on those pursuing frivolous cases. Senator Mensch was honored to stop by Pottstown Cluster of Religious Communities and present a well-deserved holiday donation. From Left to Right: Maryann Glocker (Vice President of the Board of Directors), Senator Mensch, Frank Cebular (President of the Board of Directors. 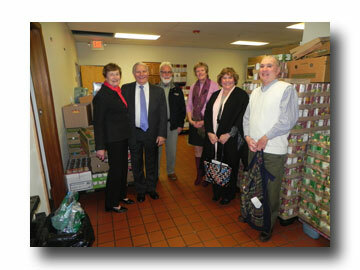 ), Barbara Wilhelmy (Executive Director), Lisa Walter (Senator Mensch’s Chief of Staff) and. Allan Altschull (Member of the Board of Directors). The Pennsylvania Department of Military and Veterans Affairs encourages Pennsylvania veterans to connect with them via their new online Pennsylvania Veterans Registry at www.register.dmva.pa.gov for assistance with obtaining veterans benefits and services. The Pennsylvania Veterans Registry is an online application that allows veterans to connect with DMVA to request information related to valuable state benefits, programs and services offered by the agency. The registry features responsive design technology to make it accessible on mobile devices and computers. A registrant’s information will be shared with the county director for veterans affairs and other relevant Commonwealth of Pennsylvania agencies in order to facilitate local connections that aid in providing service to the veteran. Watch " A Conversation About Retail Energy Choice in Pennsylvania" featuring special guest Gladys Brown, Chair of the Pennsylvania Public Utility Commission, and Ritchie Hudson, the Retail Energy Supply Association's Pennsylvania state chair.